Is purposeful geoengineering causing the ‘rapid intensification’ of the 2017 hurricanes? (CNN) – It usually takes several days to a week for a tropical storm to grow into a hurricane. But if conditions are just right, a powerful major hurricane can develop in just hours. The process, known as “rapid intensification,” has happened four times in the last month with hurricanes Harvey, Irma, Jose, and now Maria. A normal year would only see around two storms rapidly intensify. A storm undergoes rapid intensification when its maximum sustained winds increase at least 35 mph in 24 hours or less, according to the National Hurricane Center. That’s a jump of about two categories on the Saffir-Simpson scale, which grades hurricane strength from 1 to 5. Maria became the latest Atlantic storm of the year to undergo rapid intensification after its wind strength increased 60 mph in one day. On Sunday at 2 p.m. ET, it was a tropical storm with 65-mph winds; by the same time Monday, it was a Category 3 hurricane. The storm continued its rapid intensification throughout the day on Monday, finally reaching Category 5 status with 160 mph winds at 7:45 pm. 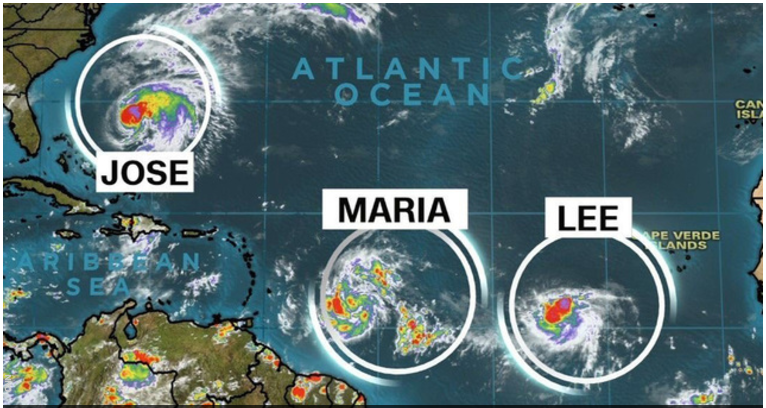 While there isn’t much definitive data on rapid intensification, a few key atmospheric ingredients help it occur, CNN meteorologist Michael Guy said. They’re the same conditions that often emerge in the Atlantic basin between August and October. Ocean water needs to be warm — more than 86 degrees Fahrenheit is ideal — with that heat extending beneath the surface. Upper level winds must be calm so they don’t disrupt thunderstorm activity. A storm’s internal conditions also must be just right. A hurricane needs a way to ventilate, much like a car engine, so it can continue to process all of the fuel from the warm ocean water and use it to strengthen the storm. Because all those pieces must be in place, rapid intensification is rare, with just one or two Atlantic storms per year undergoing such an acceleration. In 2015, Hurricane Patricia, one of the strongest storms ever recorded, went through one of the fastest and most drastic rapid intensification cycles, with winds increasing about 120 mph in 24 hours. Last year, Hurricanes Matthew and Nicole, which became Category 5 and 4 storms respectively, both underwent rapid intensification. Storms that undergo rapid intensification tend to be more dangerous than other storms because they frequently end up as major hurricanes. Adding to the problem, the speed at which they strengthen allows for less warning time. This happened to those on the island of Dominica ahead of Hurricane Maria. “The Category 5 was announced very late today,” Dominican Prime Minister Roosevelt Skerrit told CNN on Monday night. But it’s notoriously hard to predict rapid intensification because forecast models fail to pick up on all the different variables that feed into it — and because rapid intensification doesn’t always happen when the variables are present. For instance, forecast models did not predict the rapid intensification that made Harvey a Category 4 storm in such a short period before it hit the Texas coast last month.